The constellation Leo. Roll mouse over to see labels. 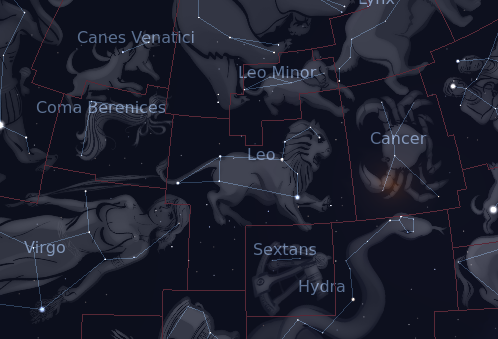 Leo is a large equatorial constellation which represents a lion. It appears highest in the midnight sky in the months around February. 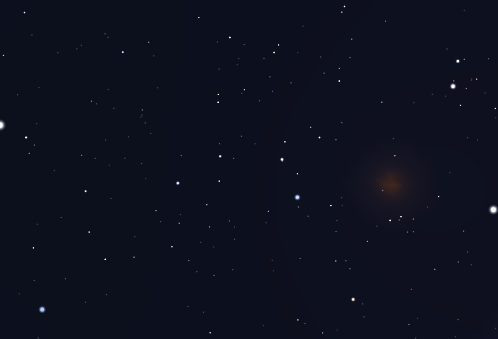 Its brightest star, Regulus lies very close to the ecliptic, the path that the Sun traces across the sky each year. The Sun passes through Leo each year between mid-August and mid-September. North of Regulus, the lion's mane is represented by a curved line of stars of second and third magnitude. Lying away from the plane of the Milky Way, most of the deep sky objects in this area of the sky are galaxies of ninth magnitude or fainter. Among the brightest of these are the Leo Triplet, a close grouping of three gravitationally bound galaxies: M65, M66, and NGC 3628. In Greek mythology, Leo is identified as the lion of Nemea, slain by Hercules. Its skin was armoured against all weapons, and Hercules' arrows deflected off the beast. After strangling the monster, Hercules wore its skin as a cloak. Leo contains the following Messier objects: M65, M66, M95, M96, M105. Leo contains the following Caldwell object: C40. The following constellations neighbor Leo: Cancer, Coma Berenices, Crater, Hydra, Leo Minor, Lynx, Sextans, Ursa Major, Virgo.